6Al-4V ELI is one of the most widely used Titanium alloys in the medical industry. It is certified to ASTM F136, and commonly referred to as implant grade 6-4 Titanium. It's properties of biocompatibility, corrosion resistance, high strength, and toughness make it especially suitable for implants and other medical devices. Resistant to a variety of corrosive environments. Freedom from chloride stress corrosion cracking. Good strength and toughness over a wide temperature range. Useful resistance to dry chlorine, fluorine, hydrogen chloride and hydrogen fluoride gases. One of the most commonly used titanium alloys is an alpha-beta alloy containing 6% Al and 4% V. This alloy, usually referred to as Ti 6Al-4V, exhibits an excellent combination of corrosion resistance, strength and toughness. Typical uses include medical devices or implants, aerospace applications and pressure vessels. In the case of medical applications, stringent user specifications require controlled microstructures and freedom from melt imperfections. The interstitial elements of iron and oxygen are carefully controlled to improve ductility and fracture toughness. Controlled interstitial element levels are designated ELI (extra low interstitials). Hence the designation Ti 6Al-4V ELI. 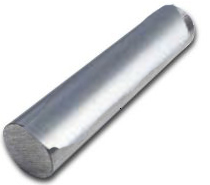 Ti 6Al-4V ELI has a tendency to stick, fret or cold weld with drawing dies during processing. Common industry practice to avoid this condition usually employs heavy etching or pickling at finish size resulting in a coarse or very textured surface. Fort Wayne Metals has developed processing techniques with enhanced surface treatments which require minimal etching at finish size to remove residual oxide, yielding a cleaner and smoother surface finish. Enhanced surface treatments and processing techniques allow Fort Wayne Metals to offer tighter and more controlled tolerances. The chart in the right column details standard diameter tolerances for Ti 6Al-4V ELI in wire and coil forms. Most diameters can be produced to tighter tolerances. Ti 6Al-4V ELI in straightened and cut bar, coil, strands and cables, flat wire and wire form to support a variety of critical medical and industrial based applications. End uses include: Orthopaedic pins and screws, Springs, Orthopaedic cables, Surgical staples, Orthodontic appliances, Ligature clips. Low interstitial version of Ti-6Al-4V, for maximum toughness. Preferred for marine and cryogenic applications. This grade is normally used in the annealed condition. Ti-6Al-4V is the preferred choice for the medical implant field. Stress relief 900-1200°F 1 to 4 hours, air cool. Duplex anneal, bar and forgings: Solution anneal 50-100°F below the beta transus, hold 1 hour minimum, air cool. Then reheat within the range 1300-1400°F, hold 1 hour minimum, air cool. Stress - relief annealing is performed after welding. 6AL-4V Titanium is a lighweight, high strength alloy. It is the most commonly used titanium alloy is use. ELI is a higher purity version of the same material, with tighter tolerances on imperfections in the alloy.